Recently, I found myself cuddled on the sofa with my dog and cat nearby, when I slapped at my arm and started itching. Was that a flea? So, I of course, checked my pets over to see if my suspicions were correct and there they were. Those tiny little brown specks. There one second and ping – gone the next. Of course, I went about all the usual steps of bathing my pets and applying topical flea treatment. I even vacuumed all the furniture and washed every thing. And two weeks later…. We still had fleas. Enough was enough. It was time to get rid of these little buggers, so I decided to chat with one of our resident experts at Modern Pest, Paul Lavallee, and understand how the Pro’s handle fleas. 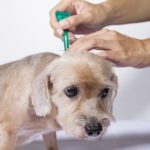 What should homeowners do to combat fleas -aside from the frequent cleaning, vacuuming and treating of pets. Is there anything else we can do? First, we would like to point out that total flea elimination can take up to 4 weeks…so please be patient. Frequently launder bedding; blankets; and anything that pets rest on such as dog beds, etc. Remove clutter to allow for thorough vacuuming and treatment (if needed) such as, under beds and minimizing stored items on the floor. But what do the Pro’s do? 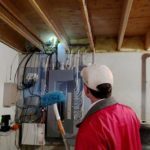 Next, a professional will perform a thorough inspection for several reasons. First, to identify the pest and make sure it is truly fleas we are dealing with. Pro’s will also want to inspect for where the fleas are likely to be most active and for items around your home that might need to be protected and/or avoided during treatment, like fish tanks and food items. Furthermore, a professional will also make sure that the home is vacated of all people and pets as a precaution, during treatment. What happens after a flea treatment? Is there a follow-up plan? Once a treatment has been completed, you will want to allow the treatment to dry for about 4 hours before re-entering the treated area. Don’t plan on washing the floors or rugs with a steam or rug cleaner, as it would only remove the treatment that was just applied. 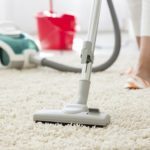 That said, you will be expected to continue vacuuming floors, carpets, and your pet’s favorite napping places on a daily basis for several weeks following the treatment. This may be the most annoying part of the process… because of the flea life cycle; unhatched eggs may stick around for some time before they hatch and become exposed to the treatment. Vacuuming will help control the remaining egg populations. But the reality is, you may still see flea activity for a few weeks after. Here’s another helpful tip: make sure you empty your vacuum outside, each time after you vacuum, that way the fleas won’t just escape back into your home! If you find yourself battling a flea infestation, don’t wait. Call Modern Pest Services today at 1-888-997-3312 or get an instant online quote for the comprehensive HomeCare Green program that controls 60 common pests – including fleas!